These American Line razor blades represent the most popular combination of features in single edge razor blades with the distinction of the American Line brand and packaging. 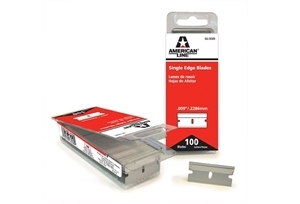 Always high quality blades, these single edge razors have carbon steel edges, aluminum backing, and a thickness of .009". These Blades come packaged in attracitive clam shells and the master case serves as a display kit for easy retail displays.